Last week, I noted that certain nanoparticles the same size and shape of toxic forms of asbestos might lead to lung disease. The research was early, but it was a “headsup” to scientists that more research was needed. Today, another nanoparticle, the round “Buckyball” type, also might enter into cells and cause problems. Nanotechnology is building tiny machines at the molecular level. Buckyballs are 60 Carbon atom balls in the shape that resembles the fullerene (goedesic dome) shape discovered by Buckminster Fuller. 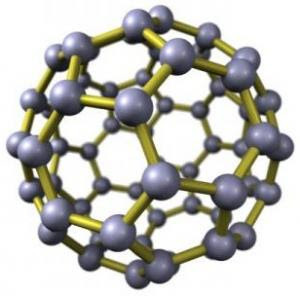 More information on buckyballs and nanotechnology can be found at this web site. In December 2005, chemists at Vanderbilt University performed a computer simulation of the buckyball chemicals entering into cells, and found that they latched onto the spiral DNA molecule, making it change shape.But now Science News reports that another computer simulation experiment at the University of Calgary shows a similar problem: that they can pass through the cell membrane and reform inside the cells, causing damage. Of course, some scientists think that this stealth entry could be used to “sneak” medicines directly into cells, or past the “blood brain” barrier that keeps many medicines from entering into brain cells. The bad news is that experiments in 2004 showed that fish exposed to buckyballs developed brain damage. And a 2004 study by Rice University scientists found that the toxicity could be modified by coating them with another chemical. So should you worry? Probably not. But something to keep in mind when you read about the marvels of new techology: yes, it may cause problems, but the scientists are also searching for problems and how to solve them. On the other hand, like all new chemicals, the possibility of not finding side effects until years later is enough to make one worry. 1 user commented in " More nanotech worries: Buckyball toxicity "
FYI there is a molecular dynamics trajectory for oxytocin here!